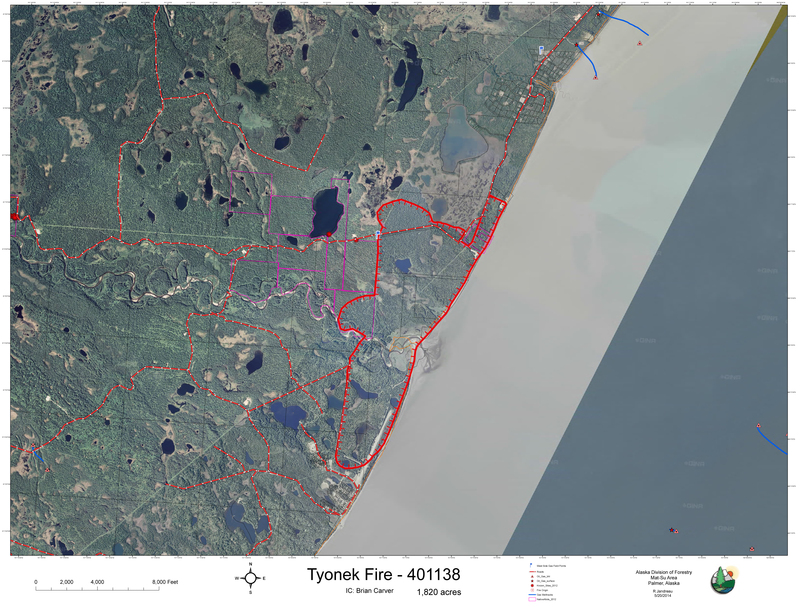 (Palmer, AK) – As of Thursday morning, the Tyonek Fire has grown to 1,820 acres. Most of the fire’s growth was due to spot fires that developed downwind of the head of the fire. In addition, firefighters conducted burnout operations around natural gas distribution pipelines and substations as well as a power line. Dozer line was completed from Beluga Road to the beach at Cook Inlet. Additional burnout operations were implemented to protect the Beluga Power Plant. This facility, located north of Beluga and 5 miles from the fire, provides power for much of Anchorage. Chugach Electric is prepared to bypass the facility should the fire reach or damage it. According to firefighters, a total of 5 structures have been destroyed to date by the Tyonek Fire. None of these structures were homes. Two were outbuildings and three were abandoned metal storage structures. There is continued concern regarding drying and windy conditions and the lack of rain in the forecast. A total of 108 personnel are assigned to the fire, as well as a helicopter, 2 engines and 2 water tenders.